Can it fly around the world without a drop of fuel? 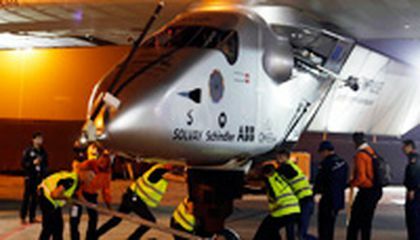 A Swiss solar-powered plane took off from Abu Dhabi in the United Arab Emirates on Monday, marking the start of the first attempt to fly around the world without a drop of fuel. 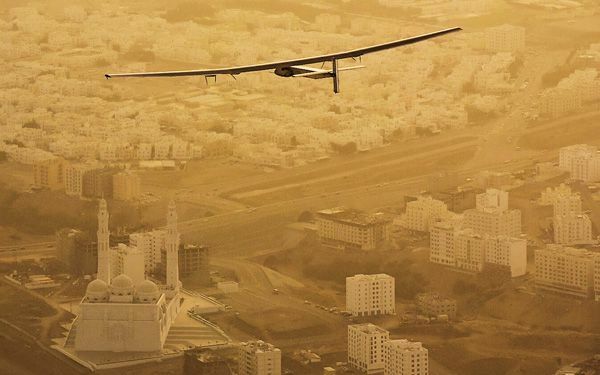 Solar Impulse founder Andr Borschberg was at the controls of the single-seater when it took off from the Al Bateen Executive Airport. Borschberg will trade off piloting with Solar Impulse co-founder Bertrand Piccard during stop-overs on a journey that will take months to complete. The Swiss pilots say their aim is to create awareness about replacing "old polluting technologies with clean and efficient technologies." The plane is expected to reach its first destination Muscat, Oman after about 10 hours of flight. Some legs of the trip, such as over the Pacific and Atlantic oceans, will mean five or six straight days of flying. The lightweight Solar Impulse 2, a larger version of a single-seat prototype that first flew five years ago, is made of carbon fiber and has 17,248 solar cells built into the wing that supply the plane with renewable energy. The solar cells recharge four lithium polymer batteries. The company says the plane has a 236-foot wingspan, larger than that of the Boeing 747, but weighs about as much as an SUV at around 5,070 pounds. The plane, in June, made an inaugural flight of two hours and 17 minutes above western Switzerland, just two months after it was unveiled. After Oman, the plane will head to India, where it will make two stops, then to China and Myanmar before heading across the Pacific and stopping in Hawaii. Then it will head to Phoenix, Ariz., and New York's biggest airport, John F. Kennedy International. The path across the Atlantic will depend on the weather and could include a stop in southern Europe or Morocco before ending in Abu Dhabi. The round-the-world trip is expected to end in late July or even August. Borschberg and Piccard say they want to push politicians, celebrities and private citizens to "confront the Conference on Climate Change of the United Nations, which will define the new Kyoto protocol in December 2015 in Paris." All countries are supposed to present targets for a new global climate agreement that governments plan to adopt at the meeting. Critical thinking challenge: Why will it take so long to fly over the Atlantic Ocean? Andr Borschberg and Bertrand Piccard are the pilots that founded the Solar Impulse. The Solar Impulse is a plane that is flying around the world without a drop of fuel. The plane took of from the Al Bateen Executive Airport and will be piloted by the two co founders making several stops around the world. The pilots motivation is to create awareness about replacing old technology with newer and cleaner technology. The journey is expected to take months and possible flying days at time while over the Pacific and Atlantic oceans. Great article i really enjoyed reading it! I think that the flights over oceans will take a while because of two hings. These two things are evaporation and because there is no land. Over land water will steadily evaporate and create clouds occasionally. Over water there is a lot of open liquid so it evaporates much faster. Since the plane needs solar power to fly it will be sluggish over the oceans because there is more vapor in the air, creating more clouds. It will need power to fly, and with less power from the oceans it will need to go slower so it doesn't run out of power. The second reason, because there is no land. Other than no evaporation restriction, the plane can't land, it has to go the full distance in one flight. What- He made a solar energy powered air plane. Why- To see if they can fly a plane with no fuel at all. Andre Borschberg created and a solar energy powered plane. His goal was to fly around the entire world. This has started last Monday and will continued through July or August time. Will they be able to fly a plane with no fuel? If so will we start having more planes with less pollution to preserve the earth? I believe that this is a great invention. Some day passenger planes will be like this and not use fossil fuels. This is a great way to show people that a solar plane is possible. A plane might be able to fly with out a little of fuel but i think that a plane can not fly with out any fuel. I do think that a plane can fly a little amount of time but at the same time a plane might crash if it doesn't have any fuel. If a plan does fly with out any fuel the pilot might have to mack stops at different places to get more fuel witch might take more money than filling to plane with fuel before they pilot takes off. I don't necessarily think this is the safest idea the world has had. Maybe it will be more environmentally and economically safe but probably not physically safe. I don't think its safe because planes that are powered by fossil fuels are crashing and having many flight malfunctions. I say we just stick to the idea our older ancestors had and either go by car or boat. In Abu Dhabi the Swiss made a plane that they will attempt to fly around the world without any fuel. This will take months to do because the world is so big and all of the stops this plane will have to make. It will take so long to fly over the ocean because the ocean makes up more than 50% of the world. Other countries are planning to make more energy efficient planes in the future. I think that the solar powered plane will do great. I think a lot of people want to go green and people are finding solutions. I think that they will make it due to the fact that there is sun everyday. All though night time flying might be dangerous. Apparently it can go between 36/mph and 140/mph as fast as a car. Also it charges up enough energy to go all day and night for 5 days straight.